This was again a pretty busy week. There were two new review opportunities open for sign-up on Lola’s Blog Tours and I had a lot of fun seeing everyone’s post during the A League of Her Own blog tour. Beside that and some marketing assistant work it was certainly a busy week. I didn’t got a lot of blog commenting done last week, so I tried to make up for that this week. While I did get quite some blog commenting done, I haven’t managed to write and schedule any post this week except for the Sunday Post and one recipe post. I have some great ideas for posts lying around and I just can’t seem to find time to write them. I also haven’t read much this week due to being busy and most of the free time I had was spent playing the game Robocraft with my boyfriend. We’ve been keeping a close eye on Pita, but as far as we can see the lump hasn’t grown yet, so I hope it really is just scar tissue. She has been really grumpy lately, she bites sometimes when she doesn’t want out of the cage, but most days we still force her out of the cage because she needs some out-of-cage time as well. I am spending more and more time on Pinterest and this week I finally decided to make a seperate board for sweet things and another for dinner. The problem was that every time I was searching for an idea of dinner I came across all the sweet recipes as well. So now I split the board in two, all the dinner recipes are on Delicious (looking) Food and all the sweet stuff is over at Cookies and Cakes. It took a long time, but I am happy to have seperate boards for them now. Lots of new recipes this week! Most turned out pretty well, I am sure I’ll make the roated carrot soufflé again for a recipe post. It was really good and sweet and makes for a great dinner or side dish during the holidays. The egg curry turned out pretty god, but the chickpea curry wasn’t as good. Both recipes used sauce from a jar, but I tried to make the sauce myself and in one instance that went right in the other not so much. The Potatoe Caserole was good, but a bit too sweet for dinner in my opinion and I already skipped most of the sugar that went into it. – Lola’s Ramblings: How do you Review? Back in the hands of Gehenna, Wraith fears everyone she loves will pay the price for her attempts to stop them. Corruption is approximately 17,000 words or 68 pages, and is the ninth of nine episodes in the second season of The Debt Collector serial. Sounds like a busy, productive week! I feel like I’m always in the same boat – if I spent a lot if time on comments, I don’t have posts written or vice versa. You can’t win! I’m glad Pita seems to be okay, though I’m sure you’ll be watching him closely. The lump they found on my stepson’s dog seems to be going down with some antibiotics, so maybe its time for the two to finally get a reprieve! I am starting to feel a bit anxious as normally I manage to write at least a few posts a week. I really should start writing some Lola’s Ramblings post, to stay ahead. Although I did end up getting two more reviews posts done yesterday, so that make same feel a bit better. And indeed there are only so many hours in a day and if you do more of one thing, you do less of something else. That’s good news about your step son’s dog, he and Pita certainly could use the reprieve! I’l keep watching her closely for a while probably, but at leats this week gave me hope it’s just scar tissue. Atonement sounds good, Lola. Is this the last book in this serial? Sometimes, I like to wait until all books are released before I start reading a series that has pretty short stories in it. I’m glad Pita seems to be doing OK, even if she’s grumpy. 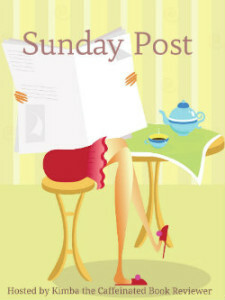 Lexxie @ (un)Conventional Bookviews recently posted…The Sunday Post #10 – A Long Week! Atonement isn’t the last book in the serial, but it is the last book of this season. Each season has a clear ending though, so the wait for the next season isn’t too bad. There will be 5 seasons in total and this is just the end of season 2. The ending was doen really good and I can’t wait to see what happens in the next seasons! Really grumpy should be Pita her middle name. She only likes eating and she can get vicious when we try to get her out of the cage, but when she wants out she doesn’t want back to the cage. But she is such a sweet girl as well and I love her even with all her quirks. So much Yummy for dinner! You had a busy week! Pinterest is EVIL, I can get lost on that site for hours. The food pictures are so pretty and I also separated all my stuff. Make it easier to find stuff. It was a busy week indeed, hope next week is a bit less busy. And the worst thing about Pinterest is that I don’t even realize how much time I spend there, but it’s a great site as well. And I just got annoyed every time I was searching for dinner as all the yummies were in the way and I just wnated to bake instead of cook dinner, so I am glad for the seperation. Concerning baking I think I might make some apple crumble muffins this evening. Pita just needs to cheer up sometimes, although yummy food usualy works best for that, lol. Happy for you that Pita is maintaining and it hasn’t grown. The fact that it isn’t hasn’t grown is a good thing, so let’s hope it stays that way. Pinterest is one of my favourite social media sites, but indeed hours can go by if you’re not carefull. You’ve been busy. I am glad Pita is doing well. I love Pinterest especially on my phone. I listen to audiobooks and pin away! kimbacaffeinate recently posted…Sunday Post #138- I seriously need to get my shopping done! Pinterest is such a fun and low key activity, I cna imagine how it would be ideal to combine with listening to audiobooks. I often use it to take a short break during work. Love the cover for Atonement. I just started Debt Collector (Season 1) and am liking it so far, must admit that seeing your reviews and how much you enjoyed them was one of the deciding factors in reading them! Yay I am so happy you started season 1 and hearing my reviews were the deciding factor in you reading them makes me really happy. It’s like the best compliment you can get as a reviewer :). I hope you continue to enjoy the season! Well you guys have never steered me wrong before! I’ve tried not to read too many reviews though, don’t want to spoil the books after all! (Though I’d probably read them anyway! I try not to include too many spoilers, but sometimes one for earlier books in the series accidently slips in. I am always carefull with reading reviews for later books in a series, don’t want to accidently spoil myself. I’ll still read books if I know what happens sometimes but I do try to avoid sequel reviews until I’ve read the previous books, mainly cause I know from writing my own that its hard not to include small spoilers! I prefer to know as little spoilers as possible before reading a book, but sometimes small spoiler are unavoidable. Which is also the reason I try to include as little as possible spoilers in my review, but ofcourse that still leaves room for interperatation as to what is considered a spoiler. The one I’ve always struggled with labelling is whether or not to mention potentially distressing subjects. I’ve read some books where abuse is a theme, and I never know whether to warn people about it if it isn’t mentioned in the synopsis. I usually don’t warn people about them, unless I had something to say about the theme or maybe that it’s a dark book or deals with heavy subjects. There is often someone else who will specifically mention it. I can kinda understand why authors might not want to put it in the synopsis as it always draws so much attention to it that way and puts focus on it and might scar away potential readers who would enjoy it. I really want korma now. Yummmmmmm! I love Korma, although I am always surprised how much variation there is in korma and they still call it korma. I have two korma recipes scheduled for next year when I am starting my new cooking feature :). It still hasn’t grown, so I think Pita is going to be alright, besides being always grumpy lately. I just love Pinterest, it’s so easy to get lost there, staring at all the nice pictures. It really helped to seperate them, but damn there were a lot of sweets I had to repin and then delete from the normal food board. It’s handier to just do it right form the start.